In maritime transportation business, demand and supply play an important role in deciding the direction which shipping cycle takes. Dry bulk shipping business mainly involves shipping of iron ore, coal, grain and other minor bulks. It comprises more than 40% of the bulk trade. In this writing, first, dry bulk shipping will be defined along with the conventional shipping cycle. After that major factors influencing the dry bulk shipping business cycle will be discussed. In the end, based on anticipated risks and decided strategies, conclusions will be drawn. Bulk commodities can be defined as the cargoes being carried in bulk carriers. Dry bulk shipping is characterized by the fact that they are traded in large quantities and they are easy to handle. Another definition of dry bulk shipping is that they are commodities which can be poured, tipped and pumped onto ships and vessels. Major bulks which get transported from one place to another include iron ore, coal, grain, and bauxite. Mostly it has been observed that Chinese imports have a large influence on the development of freight and time charter rates. From the year 2010 to 2011, the dry bulk shipping business grew by 14.8% which is a rapid expansion as compared to oil tanker shipping market (Xu, Yip, & Marlow, 2011). 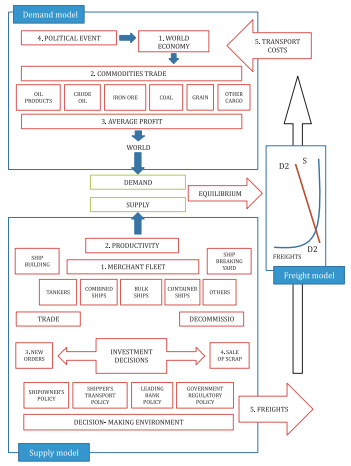 Shipping business cycle can be best explained as the interaction between supply and demand in the maritime transport sector. The first step of shipping cycle known as “trough” is characterized by an excess of capacity. It relates to the time when ships start accumulating at ports. The freight costs are typically low due to slow operations of ships. The second step of shipping cycle is known as “recovery” in which supply and demand go hand in hand till they reach an equilibrium (Stopford, 2009). During this stage, ships begin to move out and start taking new orders. The freight charges start increasing. The third step of the shipping cycle is known as “peak”, which comprises of high freight rates in the market. Supply and demand are met all the time due to which the shipping business operates at its peak of profit. Almost all of the ships are in operation. The fourth stage of shipping cycle i.e. “collapse”, occurs when the supply exceeds demand. During that, the freight rates begin to decrease. Once again, ships and containers start accumulating in the ports. Operational ships begin to slow down their operations due to which it may take longer for goods to get delivered. The primary purpose of this writing is to identify and discuss various factors which will affect the day to day business of a dry bulk shipping company. Listed below are some of the factors that will have a direct impact on the shipping cycle of the dry bulk shipping company. All of these factors will be discussed while keeping in view the four steps of shipping cycle. The demographic characteristics of a market which a dry bulk shipping company is going to target plays an important role in its successful operation throughout all the phases of shipping cycle. In target market, the selection of routes is of significant importance. All those routes having high demand are advisable to be considered for selection. Obviously, it is not possible for a new dry bulk shipping company to cover all routes of all seas. Its operations will rather start on selected routes and if the company will survive a single shipping cycle then based on the profit generated by that business cycle, it will expand and cover the other remaining routes (Schøyen & Bråthen, 2011). The target market is that critical factor in shipping business which has an indirect but significant effect on debt to equity ratio of the dry bulk shipping company as without a wise selection of maritime routes, the company will suffer from high debts resulting in making less cash in order to keep the company running. Startup costs consume most of the capital in the newly launched dry bulk shipping company. In the United States of America, on average, the associated fee for opening a new shipping business is around $750. 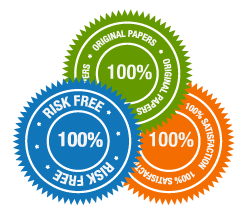 Cost related to insurances, permits, and licenses amounts to $5,000. A total of $50,000 will go in renting a facility for the opening of the suitable office. The cost of computers, printers, fax machines, furniture, telephones, filing cabins, safety gadgets and electronics for a medium sized office will amount to $15,000. An official website will cost $700. Some other additional expenditures include business cards, signage, and adverts which will amount to $2,500. On average, a gearless ship of 6,500 to 12,000 TEU ranges from $74 million to $105 million. For a new shipping company, it would not be a good decision to directly purchase new ships since it will require a lot of resources (Lindstad, Sandaas, & Steen, 2014). As far as the costs related to operations are associated, these are entirely under the carrier’s control and organizations have little or no control over it. Three of the main costs associated with operations which play an important role in the complete shipping cycle include bunker management, procurement, and asset utilization. The fixed costs including wages of the staff, billing expenditures and company daily running expenditures cannot be optimized and controlled during any step of the shipping cycle, however, variable costs such as vessel maintenance costs and bunker costs can be controlled especially during collapse when the company will be in dead need of resources to survive. Crew costs account for more than 60% of the total operating expenses (Lasserre, 2014). During high oil prices, crew wages increase due to increased demand for skilled and experienced offshore personnel. Afterward with the advent of low oil prices, when the vessels go out of business, the demand drops and so does the demand of aforementioned manpower. The dry bulk shipping company cannot simply cut the wages because it will create a risk of losing good people. Crew costs can be controlled and minimized during the recession time with the help of short duration change cycles between 4 to 10 weeks which will retain the skilled as well as reduce the annual crew costs. The increasing fuel prices have made bunker management the largest operating cost of dry bulk shipping companies. Bunkers hold more than 40% of the operational costs of dry bulk shipping companies (Catalani, 2007). By making use of new fuel-saving technologies, the company can introduce innovative mechanisms in order to reduce bunker costs. Although bunker is a commodity, the dry bulk shipping company can achieve savings user lower quality fuels where available. In many shipping companies of international influence, the strategy adopted for savings in cost throughout shipping cycle mainly comprises of reduction in terminal costs, the intermodal costs including feeder vessel hires and by making greater use of requests for quotations to know the exact and suitable time for making new purchases. In this case, while the market is booming, the dry bulk shipping company will carry out negotiations with competitive port operators in order to reduce the costs related to storage, handling of dry bulk, port costs and other assessorial fees (Goldsby, Iyengar, & Rao, 2014). While the market is down, the company can carry out the market analysis to know when the supplier’s cost for trucking, rail, and feeders is low and use the time to establish correct pricing structure. Such strategies used by various other shipping companies have resulted in savings up to 10% of the total capital. Dry bulk shipping company can take benefit of the stowage planning and container fleet management in order to optimize the asset utilization during trough and collapse. If done in the right way, it can even result in reducing the fleet size thereby saving the shipping company from the extra rent of idle ships waiting on ports during low demand periods (Jing, Marlow, & Hui, 2008). The supply side of the dry bulk shipping comprises of the ships and vessels which carry dry bulk from origin or destination. While the demand side of the shipping business is related to needs of the consumers, the shipping side is entirely related to the world merchant fleet, fleet productivity, shipbuilding production, scrapping and losses and the freight revenue (Chida & Davies, 2013). In dry bulk shipping business, often a time comes when most of the vessels owned by the company sit idle on the ports due to low demand. In the majority of the cases, those are vessels of large carrying capacity. The company should save such floating vessels for the peak time of the cycle in order to earn the maximum revenue. Whether to scrap the vessel or not, in order to reduce the fleet, depends upon the age of the vessel and related factors such as scrap prices and financial situation of the owners. If a vessel has been bought at a price of $60 million, then after 25 – 30 years, its net worth upon scrapping will not be more than $4.4 million. This shows that whether to scrap the vessel or assign it to some other carrier service, is a decision of major importance in a financial cycle of shipping. Of course, the vessel will be giving handsome profit during the peak of the supply but as soon as it hits collapse, along with the expected downturn in oil and gas market, the company will try to drive the vessels offshore in order to cut down operating costs. The increased maintenance and fuel costs of the vessel with age play a great role in decision making related to the scrapping of the vessel (Jin & Kite-Powell, 2000). So, it would be better for the company to go for the scrapping of old vessels usually have aged more than 25 years. Scrapping the ship having age less than 20 years would not turn out to be a beneficial decision for the company. In dry bulk shipping, even during the peak time of demand, some of the shipping companies face scarcity in revenue due to an imbalance of supply and demand. In order to overcome that, the company will have to invest in other stocks in order to cater for the upcoming expected bounce on investment. 4.6. Debt or equity-based financing? The strategy to follow during all four phases of the dry bulk shipping business is very important. 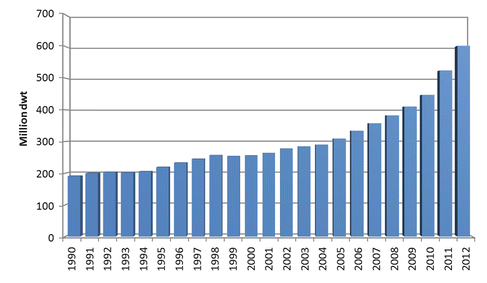 The figure below shows the increase in the dry bulk fleet time with the passage of time. The abrupt and rapid increase in fleet size would not have been possible by entirely relying on an equity-based portion of the capital structure (Albertijn, Bessler, & Drobetz, 2011). Of course, in the start, the company will have to rely on debt-based funds as well. However, the main strategy to be followed here, in case of dry bulk shipping market would be to prefer borrowed funding or debt based funding during recession periods such as trough and collapse since the time when the debut or fixed interest will have to be paid back to the charters, the shipping company will be at peak of the business or recovering from trough period and it will be relatively easy to maintain the financial balance keeping the smooth functioning of the company without failure. Both the trade development cycle and world economy have a significant impact on dry bulk shipping cycle. The changing industrial demands, transport policies, depletion of resources and relocation of processing plants continuously change the seaborne commodity trade. Other factors on demand-side influencing the shipping cycle include average haul and ton-miles of the vessel. In past, maritime trade in the majority of the cases has been boosted with the help of buying of a commodity more cheaply in a different country. 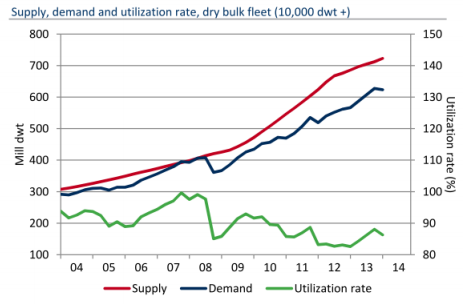 The relationship between demand, supply and utilization ratios of different dry bulk carrier companies is presented in the figure below. It is important to understand here that the utilization ration has always been lesser as expected due to the imbalance of supply and demand i.e. when the demand is high, the dry bulk shipping companies order new ships. On average it takes 36 months for a ship to arrive at the port by which the demand has reduced hereby causing loss to the company resulting in reduced utilization ratios (Kavussanos & Alizadeh-M, 2001). Often on demand side, random shocks also take places such as strikes, mechanical breakdowns, trouble with port state control and collisions. Some of the major risks related to operations of the vessel, which can widely change the scenario of the shipping cycle include ship collision, sinking, piracy, marine disasters, environmental pollution, cargo and property damage resulting in loss and business interruption. In order to minimize the associated financial consequences, the dry bulk company will have to use a range of insurance products including hull and machinery, war risk, freight demurrage and defense, bunker insurance, charterers liability, purchaser interest, charterers advance profit, ship owner liability, cargo liability and property risk cover (Trucco, Cagno, Ruggeri, & Grande, 2008). Further, it would be better to ensure the vessels not less than the vessel’s current market values. The rates of dry bulk shipping play an important role during all the steps of the shipping cycle. This is due to the fact that setting of right and attractive pricing is the only tool for marketing, which can effectively drive the business in the right direction during the peak of supply and demand. There are five major factors which influence the freight rates in the maritime shipping market. These include world economy, international maritime trade, average achieved profit, political events and transport costs. Some other factors from supply side include productivity, shipbuilding, shipbreaking and freights (Alizadeh & Talley, 2011). The relationship between these variables is explained in the figure below. In order to achieve success by carefully setting a pricing rate for dry bulk shipping, the company will have to understand the connections between world economy and politics while keeping a sharp eye for conclusions of favorable contracts. The diagnosis of the shipping market in dry bulk shipping will consist of five phases; marketing information system, analysis of marketing environment’s threats and opportunities, shipping market’s segmentation, evaluation of each shipping segment and the target market’s choice. The outcome of this practice will be an effective target market. In planning, first, the business objectives will be determined. After that, the strengths and weaknesses of the company will be identified. In the third step, the appropriate marketing steps and strategies will be identified. The last step will comprise of evaluating expected results and tracking down of alternative marketing plans. The organization stage of shipping will determine that which objectives are to be met by certain deadlines and by whom. This is the stage of marketing in dry bulk shipping in which all the funds reserved for marketing are utilized. Rationally planned business plans resulting in the provision of appropriate transport services are an important part of implementation stage. The implementation makes sure that the right services are provided to the right charterer on right time at a fair price with a suitable promotion. Control mainly comprises of the remedial measures and follow up with all the aforementioned activities related to marketing in dry bulk shipping. International maritime transportation costs are of a great interest to policymakers and shippers. As far as the global trade is concerned, dry bulk shipping handles over 80% of the total volume of global trade through shipping. 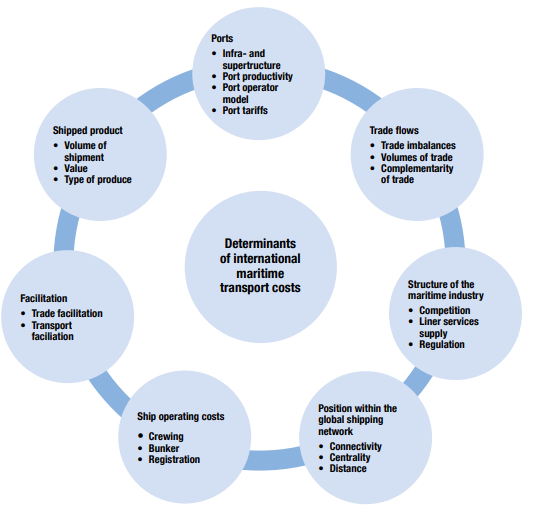 There are seven determinants of the maritime transport costs as explained by the figure. In order to have a complete and thorough the idea of what transportation costs can be faced by the company in future, the analysts of the company will have to consider all of the factors shown in the figure below in order to overcome any unforeseen loss in future. Dry bulk shipping comprises more than 40% of the maritime transportation business. The shipping cycle pattern followed by dry bulk shipping companies comprises of four stages; trough, recovery, peak and collapse. There are many major factors which impact the progress of the shipping cycle in a dry bulk shipping company. Target market and startup costs should be set keeping in view the market situation during trough and collapse phase of shipping cycle. The operational cost is another influencing factor for dry bulk shipping business on which the survival of company depends during the collapse. It can be controlled by reducing crew costs, efficient crew change, negotiations with suppliers, cost reduction in dry dockings, fuel savings and efficiency, effective maintenance and spares, cost monitoring and cost reduction. The decision of scrapping of vessels and that of owned or borrowed funds depending on the market conditions during all four steps of the shipping cycle. However, the decision resulting in a low debt to equity ratio should be made to ensure the generation of enough cash in order to keep the company running. The risks associated with ship sinking and collision along with other natural disasters can be countered with the help of obtaining a good insurance policy covering all the unforeseen circumstances. At the same time, due to high insurance cost during the period of recession, it is advisable for the bulk shipping company to invest in other stocks and businesses to meet the needs of the company when the market is down. The demand and supply side of dry bulk shipping must be well understood by the dry bulk shipping industry in order to apply the correct marketing strategy. Albertijn, S., Bessler, W., & Drobetz, W. (2011). Financing Shipping Companies and Shipping Operations: A Risk‐Management Perspective. Journal of Applied Corporate Finance, 23(4), 70-82. Alizadeh, A. H., & Talley, W. K. (2011). Microeconomic determinants of dry bulk shipping freight rates and contract times. Transportation, 38(3), 561-579. Catalani, M. (2007). Maritime networking route optimisation. Paper presented at the 11th World Conference on Transport ResearchWorld Conference on Transport Research Society. Chida, T., & Davies, P. (2013). The Japanese shipping and shipbuilding industries: A history of their modern growth: A&C Black. Goldsby, T. J., Iyengar, D., & Rao, S. (2014). The definitive guide to transportation: Principles, strategies, and decisions for the effective flow of goods and services: Pearson Education. Jin, D., & Kite-Powell, H. L. (2000). Optimal fleet utilization and replacement. Transportation Research Part E: Logistics and Transportation Review, 36(1), 3-20. Jing, L., Marlow, P. B., & Hui, W. (2008). An analysis of freight rate volatility in dry bulk shipping markets. Maritime Policy & Management, 35(3), 237-251. Kavussanos, M. G., & Alizadeh-M, A. H. (2001). Seasonality patterns in dry bulk shipping spot and time charter freight rates. Transportation Research Part E: Logistics and Transportation Review, 37(6), 443-467. Lasserre, F. (2014). Case studies of shipping along Arctic routes. Analysis and profitability perspectives for the container sector. Transportation Research Part A: Policy and Practice, 66, 144-161. Lindstad, H., Sandaas, I., & Steen, S. (2014). 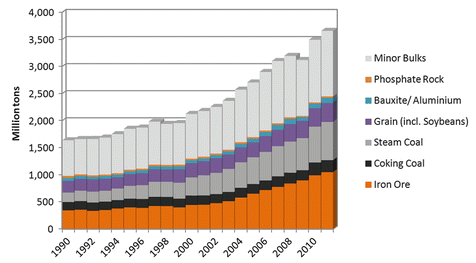 Assessment of profit, cost, and emissions for slender bulk vessel designs. Transportation Research Part D: Transport and Environment, 29, 32-39. Plomaritou, E. (2006). The key stages of marketing implementation in shipping companies: An empirical research of marketing implementation in the largest tanker and liner companies in the world. Shipping in the Era of Social Responsibility”, Greece. Schøyen, H., & Bråthen, S. (2011). The Northern Sea Route versus the Suez Canal: cases from bulk shipping. Journal of Transport Geography, 19(4), 977-983. Stopford, M. (2009). Globalisation & the Long Shipping Cycle. Presentation at: Royal Institute of Naval Architects, London. Trucco, P., Cagno, E., Ruggeri, F., & Grande, O. (2008). A Bayesian Belief Network modelling of organisational factors in risk analysis: A case study in maritime transportation. Reliability Engineering & System Safety, 93(6), 845-856. Xu, J. J., Yip, T. L., & Marlow, P. B. (2011). The dynamics between freight volatility and fleet size growth in dry bulk shipping markets. Transportation Research Part E: Logistics and Transportation Review, 47(6), 983-991.